Women make up nearly half of the entire Canadian workforce, but the perception still exists that certain jobs - particularly those in the skilled trades - should only be done by men. In reality, women excel in all traditionally male-dominated careers, including those in construction, manufacturing, automotive, mining, welding, and more. With a looming shortage of skilled trades workers, many industries have realized it's time to get past the stereotypes and employ a more diverse workforce. In sectors like construction where the demand for skilled workers is highest, companies are actively recruiting women to fill open positions. Working in the trades is often hard, physically demanding work, and women are held to the same standards as men. To help them learn the skills they'll need on the job site and prepare for a career in a male-dominated industry, an increasing number of colleges are offering free or low-cost apprentice training programs geared specifically to women. There are also mentoring groups available to support women in their decision to pursue a career in skilled trades. With proper training, there's no reason a woman can't be just as physically fit, determined, confident, and capable of operating the same tools and machinery as their male counterparts. And while physical requirements are a must in the skilled trades, it takes more than just brute strength to get the job done. A variety of skills are required to be successful in the trades, including balance, dexterity, hand-eye coordination, stamina, and even academic skills like reading, writing and mathematics. 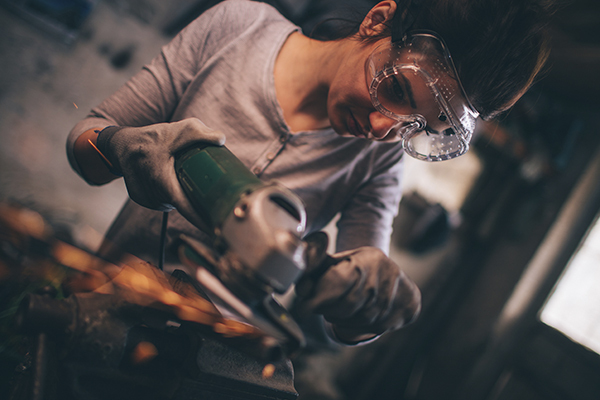 Since none of these skills are defined by a person's gender, if you're a woman interested in the trades, there's nothing stopping you from empowering yourself to put on a hard hat and a pair of steel-toe boots and shatter the stereotypes around careers in the trades.